Centennial, Colo., Jan. 22, 2018 (ULA PR) – United Launch Alliance (ULA) announced today that it has assumed responsibility for the marketing and sales of Atlas V, the world’s most reliable launch vehicle, from Lockheed Martin Commercial Launch Services. In addition to performing all of the operational activities related to Atlas V launch services, as ULA has done since its formation in 2006, ULA now has the full authority to market and sell Atlas V launch services to commercial customers. ULA leads the industry in mission and schedule reliability, building on a successful heritage of nearly six decades. When it absolutely, positively has to get to space safely and on time, ULA gets the job done. 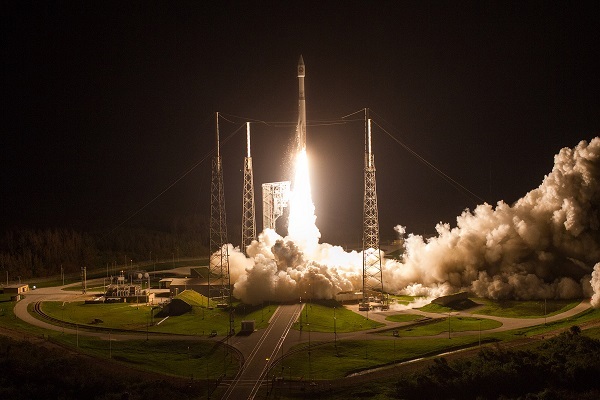 ULA’s Atlas V has flown 75 missions with 100 percent mission success, from numerous GPS satellites flying today to exploring the solar system and beyond, and has the highest reliability with the lowest insurance rates in the industry. ULA offers extensive experience from a long heritage of launching communications and Earth imaging commercial missions for customers around the world. Tom Tshudy, ULA’s vice president and general counsel, will lead the new global commercial sales organization. Before joining ULA, Tshudy served as senior vice president and general counsel for International Launch Services (ILS) as well as vice president and general counsel at Lockheed Martin while ILS was a subsidiary to sell and market launch services utilizing the Atlas II, III and V launch vehicles. Congrats to Mr. Bruno. I am guessing that should make it easier to wben it comes to bidding for contracts. I do think this is kinda a big deal. As you mention, it consolidates more of ULA within ULA’s hands: it’s hard to blame ULA for low sales if they aren’t responsible for marketing. The more important part is that Lockheed is showing they are serious about ULA and Vulcan succeeding. The Europeans did the similar but more drastic option of spinning off the ArianeGroup as an independent entity to compete more effectively. While I can’t say if this move will be SUFFICIENT for Vulcan to succeed, it certainly is NECESSARY. I wonder if the profits from Atlas launches are going to be distributed by ULA on how they see fit or will vulcan still get funding by the quarter. I think the “extending mission life” thing is the accuracy of orbital insertion. I think they are saying the payload doesn’t need to use as much onboard propellant and so the vehicle can last longer. I don’t know how much that really buys, but marketing has to say SOMETHING! My guess is that if LockMart was gonna milk this just for profit, they would keep the sales (and profits) for commercial launches. My read on this is that it’s an honest attempt to let Vulcan succeed – and that means integrating engineering, production and sales now, BEFORE Vulcan comes online.